Wednesday Fix accompanied me to the office again. Overall he was quiet and well-behaved, though his behavior is changing daily at this point and it is unlikely I will bring him back to the office until he is older and has some basic training. Puppies go through developmental stages quite rapidly from about 3 weeks through adolescence. This is especially apparent in a working bred puppy like Fix. The first week Fix was home, he stayed close at heel while we were doing chores. However, at almost 11 weeks, now that he has been in this environment for a couple of weeks, he is more comfortable with his surroundings and starting to range further away from me. He is no longer as concerned when I am out of sight and more willing to entertain himself – and not necessarily in ways that I want to encourage. As mentioned earlier, with a young puppy (or with any dog new to my household) I am initially most interested in the puppy learning rules and boundaries and manners through self-control. 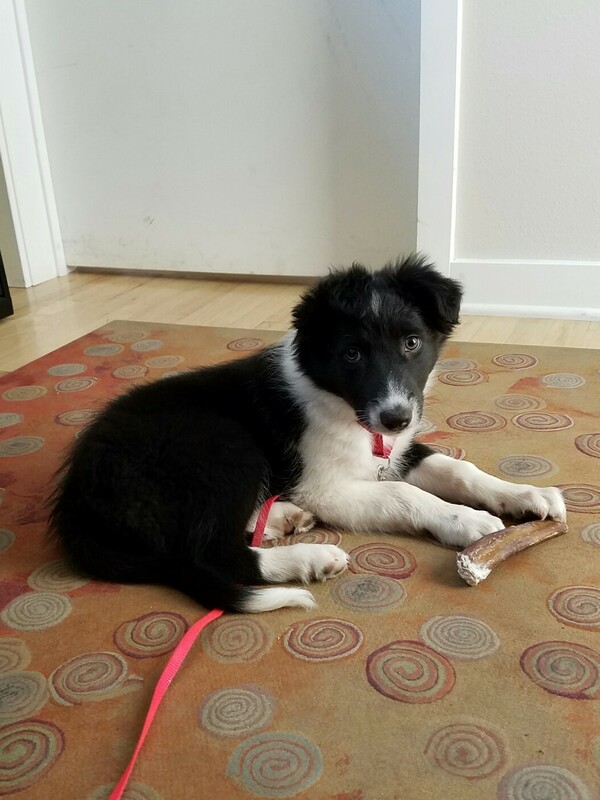 I will most likely not start any formal obedience training with Fix until he is 12 weeks old, though I judge the readiness to start training based on the individual dog and not on a specific time table. It is important to me that dogs in my household learn to internalize acceptable behavior. To achieve this goal requires that I am willing to invest the time and energy into providing an optimum environment for the puppy (or dog) to grow. I do not puppy proof my house, per se. 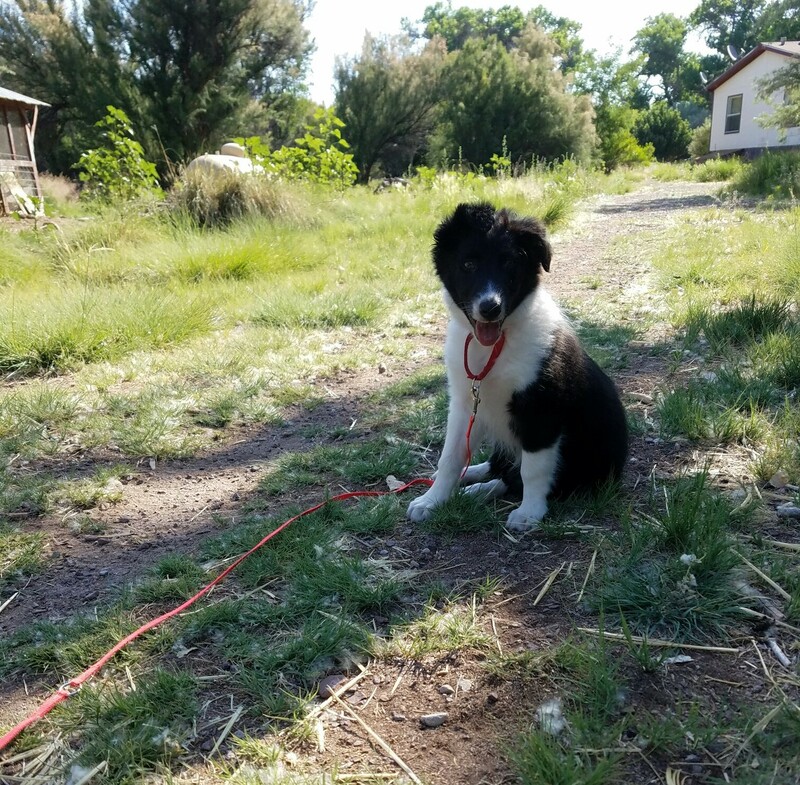 I will block off all the rooms except for the immediate area in which I am working, and I will initially crate the puppy at night while I am sleeping or on occasions when I cannot safely supervise (like last evening when I was spraying weeds outside.) At all other times, if I am home, I am supervising Fix and monitoring his behavior. It is not my goal to prevent behaviors except in cases where there is a serious danger to the health and well-being of the puppy. If Fix is never allowed to do the “wrong” thing he will never learn to discriminate between what is and is not acceptable. As a general rule, I don’t provide a negative consequence for actions I find undesirable until the dog has learned the appropriate behavior and has chosen to continue an undesirable behavior. For example, I don’t pick up my shoes as I want Fix to learn to not chew on them as opposed to training myself to never leave shoes on the floor. Quite frankly, it is a much easier task to teach Fix not to chew on my shoes than it is to try and re-train myself not to just kick my shoes off when I come in the house. If Fix starts chewing on a shoe, or other inappropriate object, I simply interrupt the behavior with a verbal “aah” and redirect him to a behavior I would prefer. If I simply stopped the behavior, Fix would find something else to do and the chances are good I wouldn’t like that behavior any better. 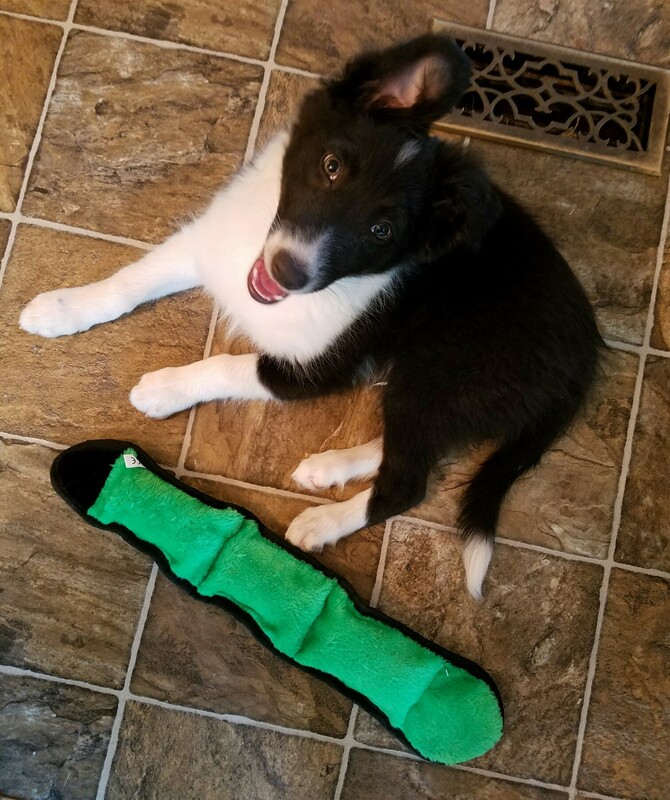 By choosing the behaviors I want from Fix and redirecting him to those behaviors, both Fix and I are less frustrated and I have a better behaved puppy who is learning what is and is not acceptable. Basically, teaching manners is no more than teaching self-control. Impulsivity and immediate gratification are hallmarks of young children (or young dogs). However, living in a social structure successfully requires that one learn self-control and how to defer pay-outs. This is a challenge for young animals, mainly because their brains are still developing and the synapses are not fully formed. For this reason though, creating those pathways at a young age, means that the behaviors are more firmly established as dog (or child) matures. At this age, Fix has a short attention span so I expect to have to repeat certain lessons. Consistency and repetition, regardless of training method, is the key to successful training. Perfection is not the goal when the pup is young – what is important is that the pup is developing the ability to learn and to self-impose limitations. Fix will exhibit a behavior one day and then it will disappear only to re-emerge a few days later. All of the pups were pulling on pant legs when I was visiting. That behavior stopped when Fix came home but has reared its head again in the past few days. While Fix quickly learned the crate door would not open unless he was quiet, in the last two days he has started barking at me when he wants out of the crate. Needless to say, the behavior is not producing the results he desires. He is automatically sitting while I prepare his meals (he eats a raw food diet) and when he gets fed from a dish (usually in the mornings when he gets organ meats, yogurt, egg and a vegetable), he is now exhibiting a sit until released (about 45 seconds right now). He sits when I am putting on his collar and is learning to sit rather than jump on me when he wants attention. None of these behaviors have been taught other than to open the crate door, put the food dish down and leave it down, etc. when Fix is exhibiting self-control. As Fix is now at the age where he is no longer following me closely when outside, it is now time for Fix to start wearing a collar and to drag a line when he is out. It is my responsibility to set the stage where it is easy for Fix to be ‘right’ and harder for him to be ‘wrong.’ Dragging a line gives me the necessary tool to ensure that I can help Fix be right when necessary and prevent him from practicing behaviors that I don’t want. Since I want my dogs (at least initially) to be within ten to fifteen feet of me when outside, I use a fifteen foot line which I can step on when the dog starts to range further. The dog will check itself and almost always will look back at me. That allows me to either verbally acknowledge the dog or to call him to me and praise for coming (even if I have to use the line to ensure compliance.) How long Fix drags a line will depend on several factors and it may be that there are periods where he is not dragging a line interspersed with periods where the line is used again. In addition to ensuring that the dog remains close to me when outside, the line also enables me to tether the dog if I am doing something where the proximity of the dog will either hinder my activity or potentially be dangerous for the dog but where I want the dog to learn that part of the ‘job’ is to stay out of my way and be quiet at times. i could read all day. Thank You. what came through that is so important to me is that it is ongoing and steady. the steady ongoing consistency. this now, since there are still things to learn.